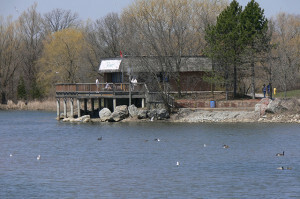 The Unionville Valleylands are located in the heart of Unionville.Toogood Pond was named after Arthur Toogood who owned the pond prior to the Town’s acquisition in 1980. The shady 4 km trail around the pond was constructed in the early 1980’s. An extensive trail system was built in the valley, to the north of the pond, in 1995. A naturalized pond edge, fishway and community plantings of native trees and shrubs were added in 1997. Many waterfowl inhabit the area, including Canada Geese, Mallard Ducks and Blue Herons. The snapping turtle and muskrat are also known to inhabit the area. Austin Drive Park has two storm water ponds that collect the local run off of rainwater, which slowly flows into the river. This reduces erosion and the amount of sediments flowing into the river during storm events. Mildred Temple Park is located south of Highway 7, east of Main Street Unionville and is a good place to see a naturally meandering river. 10,000 Trees for the Rouge Valley and the community have played an active role in vegetating Mildred Temple and Austin Drive Parks, with the planting of native trees and shrubs in the 1990’s. Songbirds, such as gold finch, cardinals and sparrows can be commonly seen here, with the occasional red tailed hawk. Parking East side of Carlton Rd. West of main St. Unionville.